After a somewhat disappointing January, the Idaho West Central mountains are about to receive new snow during the next 48 hours. Check the chart with probabilities for more than 2.5 cm for the next 24 hours. Wanting to just get out to the Idaho backcountry and check the surface snow conditions before the new snow comes, I went for a short tour to Mores Creek Summit. Considering the wind, snow surface, and temperatures it was no surprise the lack of surface hoar formation or "Near Surface Facets" in the snow surface - that was good news. The bad news was that surface crusts can be found at all elevations and aspects, even the northerly aspects. In addition, the surface crust is undermined by 10-20 cm layer of "near surface facets". The skiing was high in instructional value today. At lower elevations with E or SE aspects a supportable crust was grippy and more fun than the zipper or thick breakable crusts of N and NE aspects. The right hand column (behind the shovel) is the top 20 cm slab, and the left hand the bottom 30 cm thick slab buried 50 cm under the snow surface. These slabs were cohesive enough to stand vertically after completing the "Propagation Saw Test" (PST). From the snowpit profile alone it would had been difficult to identify the cohesive slab and weak layer/interface. Moderate Trigger Likelihood - CT12 @ 20 cm, and CT19 @ 50 cm. Low Propagation Likelihood - negative PST and ECTN. Moderate Slip Likelihood - Q2 results. Moderate results are what it is typically characterized as yellow conditions, meaning that we need more data and it is prudent to proceed with care. The crust structure at Mores creek appear to be widespread and uniform, and the ice ring around trees are connected to the multiple existing crusts. This is one of those times where the snowpack is well anchored. In addition the heavier crust at East aspects make difficult to trigger the two weaknesses at 20 and 50 cm. This could change with rapid loading (big storm or wind loading) or rapid warming, both of which are NOT expected or forecasted during the upcoming week. I have been experimenting for few years with IR thermometers to speed up the temperature profiling of a snowpit. The chart included below was generated form IR thermometry. This information is key to determine what type of metamorphism is active (rounding/sintering or facetting). 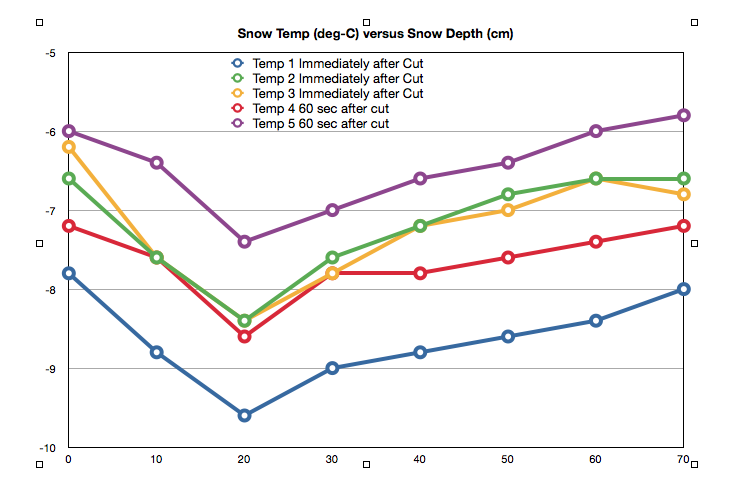 The next chart for various temperature recordings documents a gradient close to the 1 degree Celsius per 10 cm in the top 20 cm of the snowpack. As commented before, below the surface crust a layer of small NSF (near surface facets) was observed at all elevations with E, NE, and N aspects. Based in the above temperature profile the temperature gradient between 20-70 cm is much smaller than 1 deg-C per10 cm. This suggest that the snowpack is gaining strength due to rounding (rounding of facets), sintering (development of inter grain necks) and settlement (compaction due to gravity). Included below, photos of the surface hoar crystals buried 50 cm unders the snow. These surface crystals have undergone some level of rounding, but there are just too BIG (excess of 4 mm) to sinter or develop necking with other grains. The large and rounded SH (surface hoar) crystal included below were loose and noise in the plastic snow card. I included the pictures to assist other is identifying this difficult to detect layer. 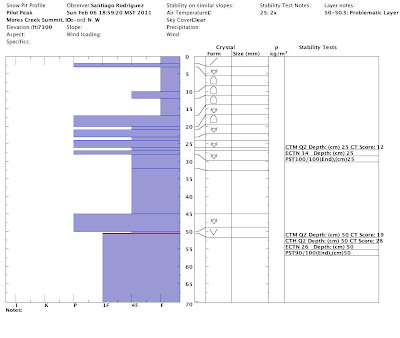 The lack of propagation potential of this layer during today's stability test, rounding of the SH crystals, and the fact that the SH layer appear to be collapsed, suggest that this weak layer is not active. I still recommend to continue to monitor this layer during the next weeks. There could be slopes at higher elevations, or very steep slopes where the snowpack has not yet collapsed or stabilized the SH layer, and it is waiting for a human trigger. 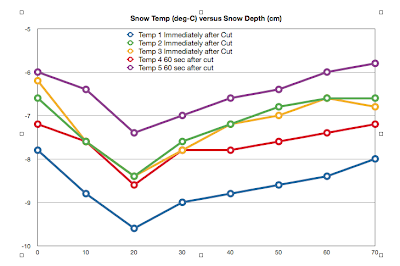 Finally, Pedro (my son) has been working on a NEW website to collect snow stability data. He named the website BDC (Backcountry Data Center). Feel free to visit the facebook page showing the progress of this website to be unveiled next season 2011-2012. He welcomes any input you might have.